Cedric Coucke got his degree as M.D. in 2001 at the Rijksuniversiteit Ghent, Belgium. Training in general surgery was done in both the university hospital of Ghent (for three years) and in the clinic of AZ St Jan Bruges, Belgium (also three years). He graduated in general surgery in 2007 and received the “Pfizer research award and educational grant”. After his graduation he started his training to become a vascular surgeon for two years at the University Hospital of Ghent and obtained the qualification of “bijzondere bekwaamheid in de vaatheelkunde” in 2009. Since then, he started his practice of vascular surgery in AZ St Lucas, Ghent, Belgium. As a vascular surgeon he has special interests in access surgery, next to other arterial and venous procedures. During his vascular training he gained interest in ultrasound to guide and help him in clinical decision making. He was trained in ultrasound techniques by Prof Dr Petrovic at the university hospital of Ghent. 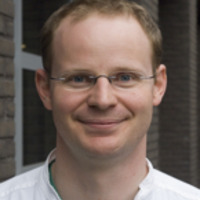 He is a co-founder of Handsonecho, a belgian practical ultrasound teaching platform, where he teaches since 2013 on the subject of vascular acces. For this purpose he uses home made ultrasound phantoms. They offer the advantage that course participants become familiar with the technique of ultrasound guided vessel cannulation in a calm and non stressful environment. He lives in Oosterzele (near Ghent) with his wife and three children. His few spare moments are spent in the air, since he is holder of a JAR-flight license as a private pilot.